Time-of-flight or ToF cameras are becoming a standard feature of smartphones. But what are they – and what do they do? The easiest way of thinking about time-of-flight is that is like a sonar system – except it uses light rather than sound to detect things. Time-of-flight cameras, or ToF cameras, are becoming an increasing common feature on mobile phones, drones and on industrial robots. Also known as depth cameras, they map out the surroundings creating a basic three-dimensional representation of what is in front of them. The camera can be used on a drone or a car to help it avoid obstacles, for instance. But the uses that ToF can be used can also be used for identifying a subject, or for gesture recognition. ToF can be used for security applications – helping to identify the user – or simply, perhaps, telling the difference between the neighbor's cat and a human intruder. They also have an important role to play in VR and augmented reality applications – allowing games, for instance, to overlay a virtual world on the real world. How do Time-of-Flight cameras work? A time-of-flight camera has an imaging sensor in much the same way as a normal digital camera. But the job of each photosite on the CCD sensor is to measure the time it takes for a beam of infrared light fired from the camera to return to the camera – after it it reflects off the objects in the scene in front of it. The whole scene is captured and measured with a single pulse of light – so there are no moving parts. As we are talking about the speed of light, the measurement takes place in far less of a blink of an eye. As every geekly schoolkid will tell you, the light travels at 300,000km per second. So for a subject that is 5m away, for instance, the time difference between the light leaving the camera and returning is just 33 nanoseconds. Or 0.000000033sec, if you prefer. These time differences are measured at every single pixel across the image – and it is this 'picture' that gives creates the three-dimensional map of the scene. And it can do this continuously – with a typical maximum frame rate of 60fps. The technology has been around for a while - but the processing speed needed has meant that this depth sensing tech has taken a little while to make it onto everyday gadgets. Current ToF cameras tend to rather low resolution. 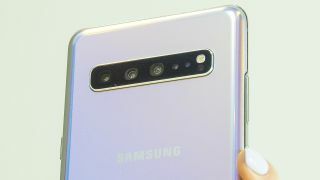 The time-of-flight camera in the Samsung's S10 5G recently-announced is just 240x160 pixels. Why ToF cameras on phones? The latest generation of mobile phones don't just have one camera. For a long while they have had two - one for photos of what is in front of them, and the other for selfies. But the newest phones have now have several front cameras - with between two and six different lenses each with their own sensors. Some of these are used to give a choice of different focal lengths – so that you get a truly wide-angle view should you want to, or a decent telephoto without the need to crop the image. But increasingly we are seeing one of these additional cameras on the front of smartphones being a ToF sensor. The ToF sensor can be used to give a additional features - and the depth information registered by it can be used in different ways by different apps on the phone. The ToF camera could be used for gesture recognition for instance - so you it can recognise that you want the camera to take a picture when you raise your hand. Similarly, the depth information can help the AI software on the phone to defocus the background of an image – giving the bokeh blur loved by professional portrait photographers. Which phones have ToF cameras? What other applications use ToF? Time-of-flight is being used in a wide range of applications... and it is not always easy to predict how they will be used. Mobile phones are in some part incorporating the technology so that it can be integrated with software and apps that have yet to be written. In the workplace, ToF sensors and cameras are sold as components. So they can, for instance, be used on production lines by robots to pick the right component, or to spot faulty goods. With drones, a ToF is a great way of seeing and avoiding obstacles – but are particulary useful navigating through buildings. What is 5G? And what will it mean to photographers? What is 8K? And what will it mean to photographers and videographers?